Breathtaking natural beauty, world-class science, and over 250 years of history combine at the Royal Botanic Gardens, Kew. Stunning landscapes, iconic buildings, and inspirational art make this the perfect day out for groups of all ages. Step into the newly restored Temperate House, home to some of the rarest and most threatened plants in the world. Get up close to 1,500 species as you explore the largest surviving Victorian glasshouse in the world. Be dazzled by 80 sparkling dragons, restored to the iconic Great Pagoda after more than 200 years. Discover the extraordinary life of bees in The Hive. Set in a beautiful wildflower meadow, this incredible structure hums and glows, echoing activity in a real bee hive at Kew. Take a stroll between the Great Broad Walk Borders, where colour and texture delight the senses. From charming carpets of bluebells in spring to tropical escapes in winter, Kew has something to offer all year round. Chihuly at Kew: Reflections on nature - From 13 April to 27 October 2019, the world’s most celebrated contemporary glass artist, Dale Chihuly, brings his work to Kew’s stunning backdrop. In a major exhibition, visitors will discover unique artworks in 13 locations from glasshouses and vistas to galleries. Opening Times: Open daily from 10am, closing times vary according to the season. Closed on 24 and 25 December. 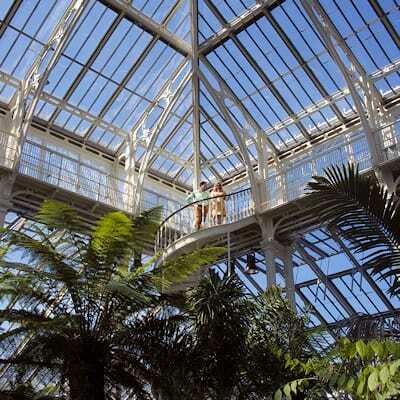 Children aged 4-16: £6.60*, Students: £9.90*, Kew members free. Book online for reduced prices. Facilities: 5 restaurants and cafes, 3 art galleries, 2 shops, guided walking tours, Kew Explorer (land train with commentary). Coach/car parking: Car parking at Brentford Gate entrance. Limited free parking for coaches along Kew Road and around Kew Green - subject to availability. Location: Kew Gardens is just 30 minutes from central London, with excellent transport links by road and rail. 5 minutes' walk from Kew Gardens underground station and 10 minutes' walk from Kew Bridge national rail station. Easy access from the M3, M4 and M25.